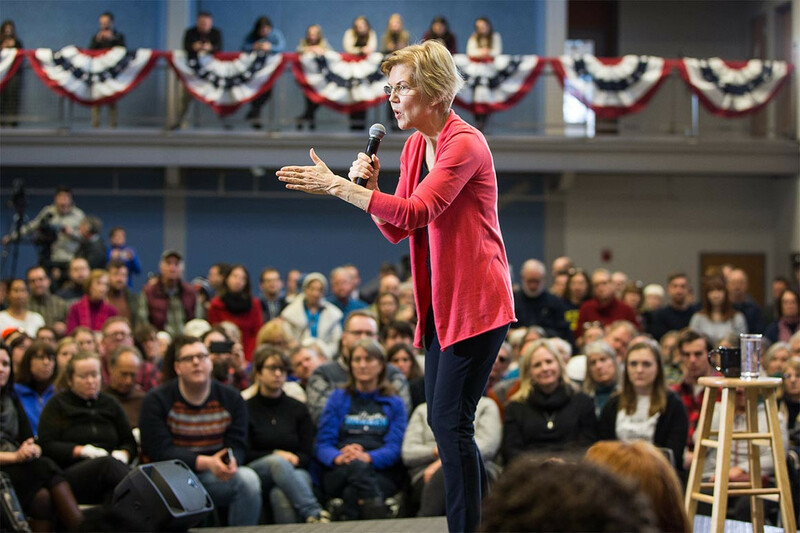 MANCHESTER, N.H. — Sen. Elizabeth Warren called for “systemic change” ranging from eliminating for-profit prisons and legalizing marijuana to establishing more equitable housing programs during her first New Hampshire swing of the 2020 presidential campaign Saturday. The Massachusetts Democrat is seen as a strong contender in the neighboring Granite State’s early 2020 primary, where her closest competition could be Vermont Sen. Bernie Sanders, who won the state’s 2016 Democratic primary and is weighing another run. During an hour-long question-and-answer session Saturday, Warren repeatedly highlighted issues faced by people of color, a group Sanders struggled to reach in his first bid for the White House. She said the United States should do away with for-profit prisons and legalize marijuana to put an end to disproportionate arrests and convictions for people of color, responding to a question on criminal justice reform asked by 26-year-old Pedro Altagracia of Concord. The Massachusetts Democrat also touted her plans to build more housing and make rent more affordable for middle and lower-income families. She called for boosting the estate tax that was phased out under President George W. Bush and again targeted by Republicans in their 2017 tax overhaul. “You could pay for every single one of those 3.2 million housing units without costing a single middle-class family in America one thin dime,” Warren said. In her stump speech, Warren, a former Harvard professor, brushed off the assumption that she is a product of the Ivy League. “For those who think I was born at Harvard, in fact, I went to the state law school,” she said, referring to Rutgers University in New Jersey. As she did in an earlier swing through Iowa, Warren emphasized her upbringing in Oklahoma, her older brothers’ service in the military and her parents’ struggle to keep their finances afloat. Warren was the first household-name Democrat to announce an exploratory committee. As she courted New Hampshire voters in Manchester and at a house party in Concord, the 2020 field grew by two. Democrat Julian Castro formally announced he’s running at a San Antonio event after launching an exploratory committee in 2018, and Hawaii Rep. Tulsi Gabbard announced her 2020 run on CNN the night before. But Sanders was the competitor on the minds of many in the crowd Saturday, several of whom told POLITICO they were deciding between the Vermont lawmaker and Warren. Megan Arsenault, 27, of Concord, said she voted for Sanders in 2016 but is undecided whether she will support him again or root for Warren in 2020. She said she supported the Consumer Financial Protection Bureau, which Warren proposed and then set up after it was created by the 2010 Dodd-Frank law. “It’s up in the air at this point,” Arsenault said of her 2020 primary vote. “I don’t know if she’ll be the final candidate I support, but I’m a great admirer,” said Rosie Little of Concord, who said she agrees with Warren’s plans to help the middle class. Rich Lawless of Hooksett, 61, attended the Warren event with his 10-year-old grandson Killian Kirby. “We’re here to see the show. We’re here to listen,” Lawless said. The pair are aiming to see as many 2020 candidates passing through New Hampshire as they can. Last cycle, Kirby attended events for President Donald Trump and Clinton and met Sen. Rand Paul (R-Ky.). Lawless said he voted for Trump in 2016 and that he’s glad to see construction booming in New England, but his mind isn’t made up for next February’s primary. Warren, a vocal critic of the president in the Senate, has stayed away from using Trump’s name on the campaign trail over the last two weeks. It’s a departure from her 2018 reelection strategy, when she often tied her Republican opponent to the president during debates.